During the past three decades, the development of highly integrated global value chains in which products are supplied, manufactured and distributed across national boundaries have created a new form of division of labour among Asian economies, especially in North-East and South-East Asia. The rapid growth of global value chains has dramatically changed production patterns, international trade and foreign direct investment in the region, with a notable expansion of intraregional trade through multiple border crossings of parts and components. While literature has increasingly examined the global value chain phenomenon in Asia, little attention has been paid to its expansion from developing countries to less developed neighbours, such as least developed countries. The lack of existing research and reliable national data has made an adequate review of global value chains in less developed countries particularly difficult.Against this background, key research questions of this case study are proposed as follows: What are key drivers of global value chain, particularly in less developed countries? ; How do sectoral characteristics impact on the development of global value chains? ; How can public interventions accelerate the expansion of the global value chains in less developed countries? This study is based on both quantitative and qualitative analyses. 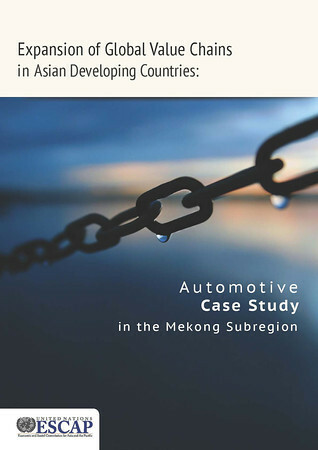 Trade, foreign direct investment and descriptive data are used to review the ongoing integration of the subregion into the global automotive value chains. The outcomes of three industrial surveys in the subregion are also reviewed to identify sectoral issues in the automotive industry.